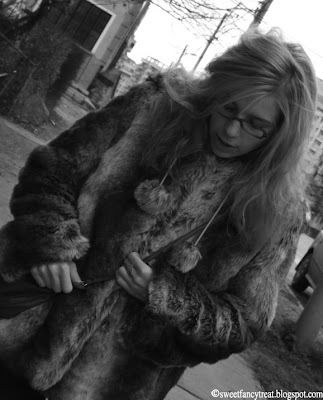 I never owned a fur coat before. Of course it's not real, but it's nice referring to it that way, it's more specific. So, meet my faux, fake, polyester-eco coat, whatever you like to call it. Got it yesterday. Truly epic. I'm not sure what to say about it, besides the fact that is mind-blowing warm and so nice rubbing against it. Haha. It sounds silly, but it's incredibly good to wrap yourself in it when the wind takes itself too seriously. I wore it today outside and it's amazing. I don't think I will wear it so much during daytime, as I got it more for evening/night outings. Oh dear, it might as well win me over and start wearing it more often. Warm and comfortable items would take over anyone's heart. We shall see. And because I amazed myself by getting the fur (it didn't even cross my mind before, but then again here we are) a thing I must add is that it has a hoodie. How convenient. Never say never. All this babbling about fur makesme think about the nothern hemisphere, an all-white perspective ahead and clouds of smoke coming from the chimneys. Things which all come resembling a fairytale since there's still no snow, but hey, at least the air is keeping cold. And the winter break finally, officially and seriously started. Woo-hoo!! That is a lovely coat--I hope it keeps you warm this winter. That coat is so pretty, I love the pom-poms. And I'm glad its faux. 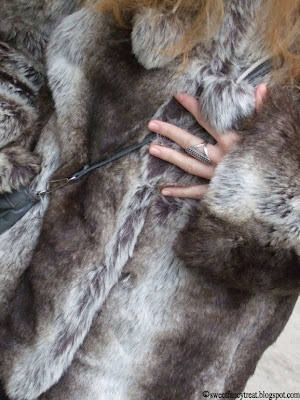 I have such a love/hate relationship with fur, even the fake ones, but you are really ROCKING that coat! You look amazing!